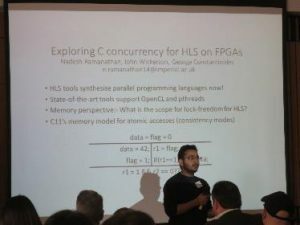 Posted February 5, 2019 by Nicola Hann & filed under Uncategorized. 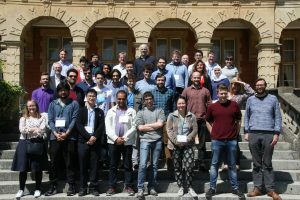 HiPEDS PhD student Miten Mistry has been selected to display a poster at the House of Commons, as part of the STEM for BRITAIN 2019 poster competition for early-career researchers. Miten’s research, joint with BASF, Dr Ruth Misener and Dr Dimitris Letsios integrates data-driven models into larger decision making problems. STEM for BRITAIN is a competition designed to promote Britain’s early-stage and early-career research scientists, engineers, technologists and mathematicians; through presenting and discussing their research with Members of both Houses of Parliament at Westminster. Posted September 17, 2018 by Nicola Hann & filed under Uncategorized. Posted July 18, 2018 by Nicola Hann & filed under Uncategorized. Posted June 4, 2018 by Nicola Hann & filed under Uncategorized. In beautiful weather mid-May 28 PhD students from three CDTS based at Imperial, Cambridge and Warwick participated in a two-day creativity sandpit, spread across three days. We were very fortunate to welcome to the event industry engineers who each presented a challenge, which the students would work on during the event from the Royal Mail, ARUP, and Greater London Authority. Each gave a stimulating briefing for their challenge: Optimising (both environmentally and financially) country–wide mail delivery, new commercial ventures for empty van space utilisation; Flood-defences in a coastal city in times of climate change; Tool for linking London Boroughs cultural activities and maximising participation through suitable advertising and social media. Together with five academics from Imperial, Cambridge and Warwick, the challengers participated as mentors throughout the sandpit, giving valuable guidance and feedback. The underlying theme of the workshop was reflecting on various activities, all of which can enhance creativity in different ways. During the first day, the students learned about the challenges, started asking questions and having initial ideas, got to know each other, and built Rube Goldberg contraptions for popping party crackers. There was also an activity to demonstrate different aids to being creative. On the second day they constructed mind maps and thought of potential solutions ideas for the problems before forming small groups to work on one of the problems for the remainder of the workshop. After initial presentations and feedback from everyone, the mentors ran a “test lab” to help the students challenge themselves further about their ideas. On the final half-day, the students presented their ideas for final feedback and then gave an elevator pitch to conclude. Students appreciated the chance to discuss research ideas from an industry perspective and to work on real industrial challenges. The aims of the sandpit were several: to give them an opportunity to reflect on their own approaches to creative thinking, enable them to meet and work with peers from other institutions, and to discuss research with industrial engineers. The event was facilitated by a team from The Collective. Posted September 13, 2017 by Joseph Worsfold & filed under Uncategorized. 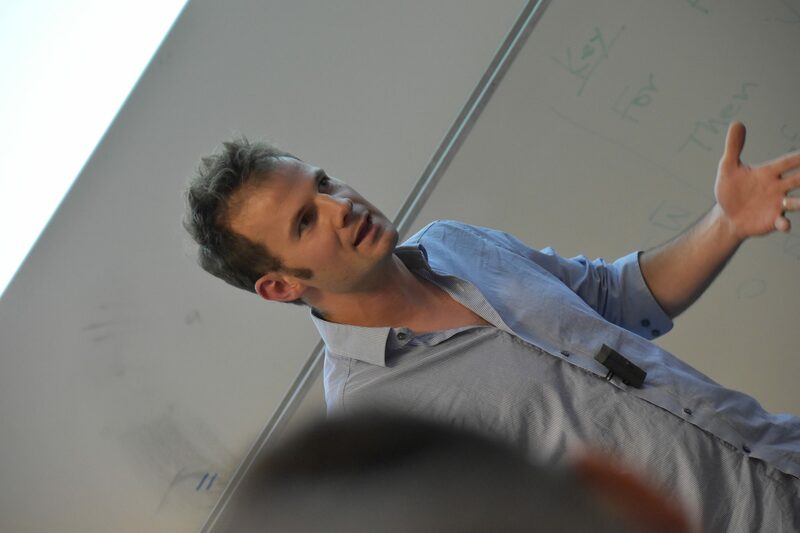 Wednesday 5th April saw the finals of the Imperial 3 minute thesis competition. 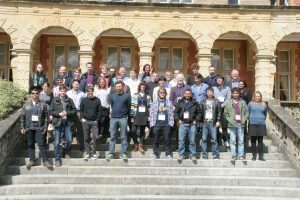 PhD students nominated from departments across the College were invited to the final competition. The format is that each student is briefly introduced by the chair person. They then have up to 3 minutes to deliver a pitch about their research. They have no notes, one slide (which is behind them) and a massive clock that ticks down the three minutes. Posted January 2, 2017 by Mark Law & filed under Uncategorized. Eleven HiPEDS students travelled to Edinburgh for the day-long event. 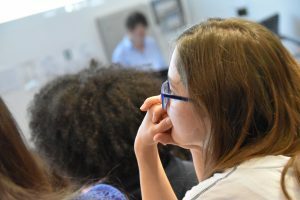 The varied timetable included 1.5-minute and 1-slide research briefings by 27 PPAR and HiPEDS students, followed after a break by 4-minute company presentations by about 17 industry partners. The latter included descriptions of internship opportunities as well as more general activities of the company. These talks prepared the way for networking over a long lunch break where students presented posters of their research, followed, in the afternoon, by one-one 5-minute chats with partners about internship and/or research possibilities. All aspects of the event were appreciated by students and industry alike, and the day ended with a final networking reception. Posted November 4, 2016 by Krysia Broda & filed under Uncategorized. Protocopier is a group project within HiPEDS, developed by PhD students who started in October 2016, with support from Dyson Limited, and the Dyson School of Design Engineering. Full details can be found on their group project site. Posted August 15, 2016 by ltb10 & filed under Uncategorized. Posted June 23, 2016 by ltb10 & filed under Uncategorized. Posted May 18, 2016 by ltb10 & filed under Uncategorized. 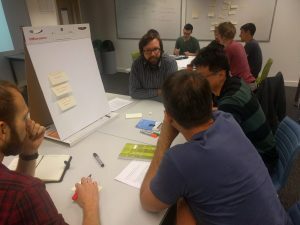 At the end of April 27 PhD students from three CDTS based at Imperial, Edinburgh and Oxford participated in a two-day creativity sandpit. 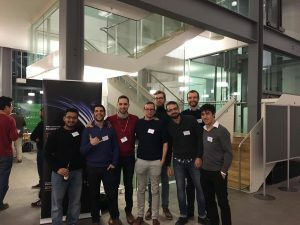 We were very fortunate to welcome to the event three industry engineers, Walt Aldred, Research Director and Scientific Advisor for Drilling at Schlumberger Gould Labs, Dr. Nathan Chong, ARM researcher, and Dr David Sharp, Head of Technology 10x at Ocado. Each gave a stimulating briefing for their challenge: Underground SLAM, Novel parallel algorithms for warehouse operations, and New applications and opportunities with the Internet of Things (IOT). 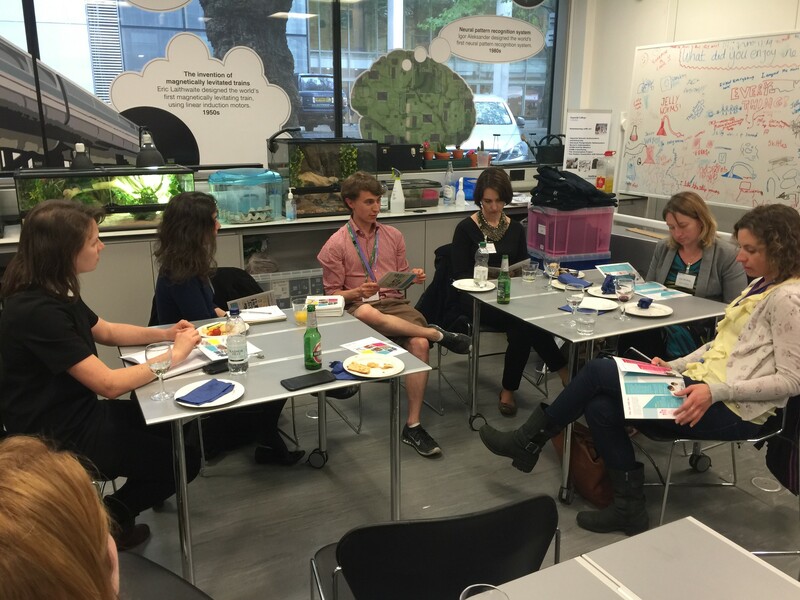 Together with four academics from Imperial and Edinburgh, they then participated as mentors throughout the sandpit, giving valuable guidance and feedback. Professor Peter Childs of the Dyson School of Engineering at Imperial gave a plenary talk entitled “Ideas to Reality”, which offered a compelling picture of the importance of creativity and design, and Imperial’s impressive track record in turning this into industrial impact. During the first half-day, the students learned about the challenges, started asking questions and having initial ideas, got to know each other, and built some weird Rube Goldberg contraptions for popping party crackers. On the second day they constructed mind maps and formed groups to work on one of the problems. After initial presentations and feedback from everyone, the mentors ran a “test lab” to help the students challenge themselves further about their ideas. On the final half-day the students presented their ideas for final feedback and then gave an elevator pitch to conclude. They formed seven groups, and many exciting ideas emerged. 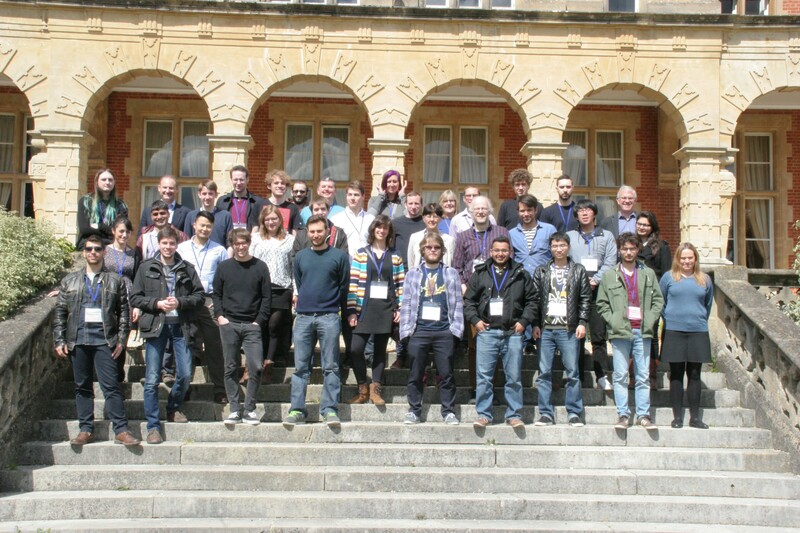 One group worked on a novel approach to “underground vision” and several groups worked on algorithms for autonomous robots careering around a large warehouse without colliding, including from one group a simulation built during the event, There were three innovative IOT applications, for smart city lighting, a non-invasive hormone detector and emotion directed music. The event was organised by HipEDS Programme Director Dr Krysia Broda and facilitated by a team from Knowinnovation.